After not making CSS’s midterm rankings for North American goalies, Logan Halladay sure made enough of an impression in order to jump into the number 16 spot (for North American goalies) on CSS’s final rankings. Playing with the Janesville Jets of the NAHL this past hockey season, Halladay certainly didn’t fail to make himself known on the ice as he appeared in 31 games for the Jets and recorded a 2.26 GAA and .932 Save Percentage. 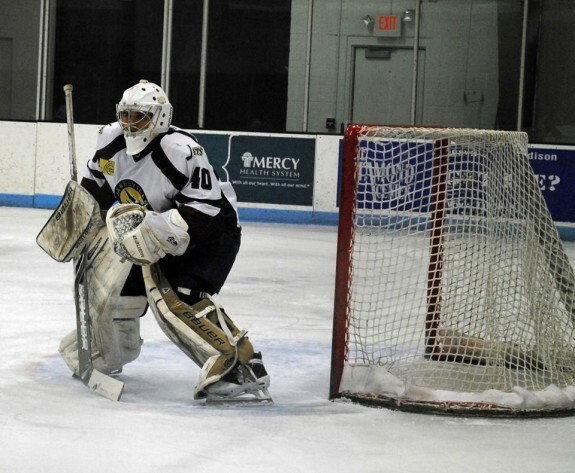 Not only did Halladay’s numbers stand out in his first year in the North American Hockey League, his dedication to his craft enabled him to set a future path for himself as the goalie made a commitment to play for the Bloomington Thunder of the USHL and the University of Minnesota for the upcoming hockey seasons. While NCAA hockey fans might have to wait a little while longer before Halladay makes his collegiate debut, there is definitely much to be excited about when it comes to the seventeen year old netminder. Logan Halladay ascended CSS’s 2014 Final Draft Rankings and it’s not hard to see why as the goaltender’s work ethic is second to none (Janesville Jets/NAHL). With a wide variety of experiences under his belt already, Halladay certainly doesn’t lack the confidence and mental fortitude necessary to be a successful professional goaltender. Recently, The Hockey Writers had a chance to sit down with Halladay and talk about his experiences leading up to the draft – and it was plain to see how such a young individual could be so well prepared for the road ahead of him. The Hockey Writers: What was it that initially got you into the game of hockey and the position of goaltender? Logan Halladay: Well, when I was younger, my older brother actually started playing hockey. My mom taught him how to skate and he was a forward at the time. We were playing roller hockey growing up in North Carolina and it was kind of a big thing, and he [my brother] needed someone to shoot on so I got thrown in the net in street hockey. Then we went to a “stick and puck” or an open skate for our first time on the ice – and actually the first time I ever put goalie pads on on the ice there was a travel coach there and he said, “We don’t have a goalie right now and we’re looking for a guy,” so he kind of offered me a spot right there. We went home and thought about it for a little bit and I said, “Why not?” I tried it out and I loved it my first year. I had a blast and my brother kept playing – I always looked up to him and how hard he worked – so we just stuck with it from there and grew up playing. A lot of it was roller hockey, but then we made the transition to the ice and it took off from there. THW: Could you describe your experience playing Midget hockey? LH: It was a great opportunity. The Junior Hurricanes organization is top-notch and I don’t have enough good things to say about the organization. They provided us with everything that we needed from coaching staff to team managers. Everyone is so supportive and on the same page and everyone has this same vision of developing kids into great hockey players. We grew up in that organization and were playing in it from a very young age. THW: In an interview conducted with Justin Goldman during the 2012-2013 hockey season, you said that you went through a lot of ups and downs. What did that experience of battling every night teach you and what kind of insight did it give you in relation to being a goaltender? LH: You know, it was a tough year, definitely. We had a lot of team struggles – as well as myself as I struggled quite a bit. We had a couple of injuries and didn’t play with a full roster for too long. There were some games in a row that we couldn’t win – I think we went on a ten or an eleven game winless streak – there were just losses and ties and it was frustrating, but I’m a firm believer in hard work and that hard work pays off. It kind of taught me that when things aren’t really working out your way you have to bear down, grit it out, keep working hard, and eventually things will turn around. It gets to a point where things can only go up from where you are and a lot of it is also just keeping a positive attitude and trying to maintain positivity throughout the day. You also realize that you’re not the only one going through it as there are a group of 15, or however many guys, that are all going through it together. It’s not an individual sport at all, so you use your teammates and your family and you lean on them. You kind of bear down together and we all focused on a common goal by taking it back to the basics a little bit, but it just taught me that when stuff isn’t going your way you just have to keep working hard, keep staying on track, try to maintain your focus, and stay positive. So you really have to be mindful of your team because your attitude not only affects you, but it affects your teammates, and if you allow your attitude to negatively affect your teammates then a lot of bad stuff is going to happen from there. I think the big thing was just the positivity aspect and the work ethic, you can’t get too down on yourself and you just have to keep working hard, keep pushing along, and things will turn out right. THW: Was there a particular learning experience with the Janesville Jets that made it easier for you to transition to the NAHL after playing with the Waterloo Black Hawks and Chicago Young Americans? LH: I think it was just the whole transition itself. I thought I was ready to make the jump to junior hockey with the maturity level and such. The whole Janesville Jets organization was just awesome from the beginning. Coach Dibble and Coach Largen, they were all there and were on the same page, and that was a big aspect. The whole situation there was just great and the organization just allowed you to be comfortable there and to excel on and off the ice and in the classroom. The staff was there to support you all the way. The biggest thing was the attitude and team aspect and just maintaining a team attitude. I don’t think that I had one specific experience that turned everything around, but it was more so just the overall experience of going to Janesville. Even when we went on streaks where we didn’t win a game in six or eight contests and were in last place in our division, we just kind of built character as a group, leaned on each other, and stuck together – and I think that helped us realize that when things don’t work out you have to stay on the path and keep working hard. Everybody worked extremely hard and believed in each other and we kind of pushed each other every day to keep getting better and it was just a great year overall. From the coaching staff to the managers – they gave us every opportunity to succeed and I couldn’t be more grateful for the time I spent in Janesville. Even from the beginning of the year, training camp was hard as Coach Dibble put us through some long days, so I don’t really think there was one real experience in my class that turned things around, I just think that the move to Janesville was the biggest factor in my success this past season. THW: Could you describe what it was like learning from someone like Head Coach Joe Dibble? LH: I think every coach has a different coaching style. I’ve learned a good amount from every single coach that I’ve had, and I think that Coach Dibble has played a big part in this past year. Coach Dibble was similar to a coach that I had with the Junior Hurricanes – he’s there to help you grow and learn, and he’s there to develop kids. The big part is that he wants us to have fun and for one to enjoy themselves, but he also realizes that the fun comes after the work. He really instilled a work ethic in us from the beginning of the year, so we knew that we had to work for what we wanted. I remember I was struggling at the beginning of the year, and he was there to talk to, so I think that Coach Dibble was just the finishing piece to the puzzle of coaches that I’ve had growing up. In general I just can’t say enough good things about the Janesville Jets organization and the coaching staff as a whole – every single coach from Coach Dibble to Coach Largen to my goalie coach Larry Clemens – they were all there supporting us, helping us grow, and pushing us at the same time. THW: You committed to the University of Minnesota during this hockey season. What attracted you to this school and influenced you in selecting this specific university ? LH: The whole recruiting process was unbelievable from the moment that I met the coaching staff and spoke to them for the first time at the University of Minnesota. Everything was just so professional. For myself, I care a lot about academics and the University of Minnesota had lots of options for me academically. Obviously the hockey there is second to none, so I think the thing that kind of pulled me toward the University of Minnesota was that they had the whole package. They’re an organization that’s there to win games and championships, so they don’t settle for anything less than that, and I want to be part of an organization that works hard and wants to succeed each and every day. It’s an extremely prestigious school, both academically and as far as hockey goes, so it’s kind of hard to say “No” when the University of Minnesota comes calling. I’m just really excited to go in and start my four years there and take off from there. THW: To teams looking at you at the NHL Entry Draft, what would you say are some of the strongest aspects of your game? LH: I think that some of the strong parts of my game are my work ethic and determination – they’re things that I pride myself on. I kind of use that to my advantage and make sure that I’m the hardest working guy on and off the ice every day as well as in the classroom. I think my athleticism is a big part of my game. I don’t really play a blocking style of goaltending, so I try to use my athleticism to my advantage. I try to go out there, play loose, and not too stiff. I think my athleticism is one of my biggest attributes, and so is my ability to play the puck. Back home in North Carolina, my goalie coach put a lot of emphasis on stick handling, playing the puck, being able to move around the net, and not just in the crease. As you get older and you move up the levels, you realize how important that aspect really is and even talking to some of the defensemen on the team, they tell you how much it helps and how much of a difference it makes. I think that my ability to play the puck and my decision-making when I have the puck is another one of my attributes. THW: Which parts of your game do you feel you need to improve on? LH: Well, I would say every area. I love to work and I also take pride in learning and developing every day, so I don’t think that there’s an area that I’m perfect in or ever will be perfect in. I want to improve in every single possible area, but I think the big thing is that when I was younger I relied a lot on my athleticism and ability to battle – I didn’t really have too much structure to my game, but as I got older and other teams get more faster and more skilled you kind of realize that you have to be more mindful of certain players and areas of the ice. Over the past two years – and especially this year in Janesville – I worked a lot on calming my game down, being more efficient with my movement, and not overplaying situations. I think that’s the main thing that I need to work on still. I’ve gotten a lot better with it, but I think that there’s always room to improve in terms of being more efficient, controlling myself more, adding more structure to my game, and being able to use my athleticism when it’s needed and not just over-relying on it. I just want to be the best that I can and I want to learn by taking stuff from each coach and goalie coach so that I can improve in every single area. THW: You mentioned your stick-handling abilities. Growing up, was there a goalie in particular that you liked to watch in order to help you cultivate such skills? LH: I think that Martin Brodeur is probably the big one. He’s probably one of the best stick-handling goalies that has ever been around. I’m able to watch more goalies now and there are a lot of range of goalies now that handle the puck. I watch a lot of Mike Smith and how he handles the puck, but growing up I think the main guy that I watched was Martin Brodeur since he was kind of the main people to do it back then and he still is in the modern day. And a lot of it goes back to decision-making as well. I watch a lot of video and pause it to see where the play is and what the options are so that I can put myself in that mindset and try to see what the best route of action is. I think a lot of my development and my stick-handling abilities have come from studying NHL goalies – and growing up Martin Brodeur was definitely the guy that I looked up to. THW: Is there any NHL or professional goalie that you play like, resemble, or try to mimic? LH: I think that every goalie picks their own style and plays their own way. You have goalies like Carey Price and goalies like Martin Brodeur who rely more on their athleticism. I really don’t try to emulate one goalie because I’m not trying to fit a mold that isn’t me. I want to be my own goalie and stop the puck in my own way that I’m comfortable with. I think that I don’t really try to emulate a certain goalie, but I definitely watch a lot of film on NHL goalies and take certain things from them – watching the way they move and the save selections that they make at different times. I like to learn a lot, so I watch a wide variety of goalies and try to take a little bit from each one and learn a little bit here and there. I think if I ever would choose one goalie that I play like, then it’d probably be like a Braden Holtby – a goalie that doesn’t sit back in their own net and plays a more athletic and aggressive style. 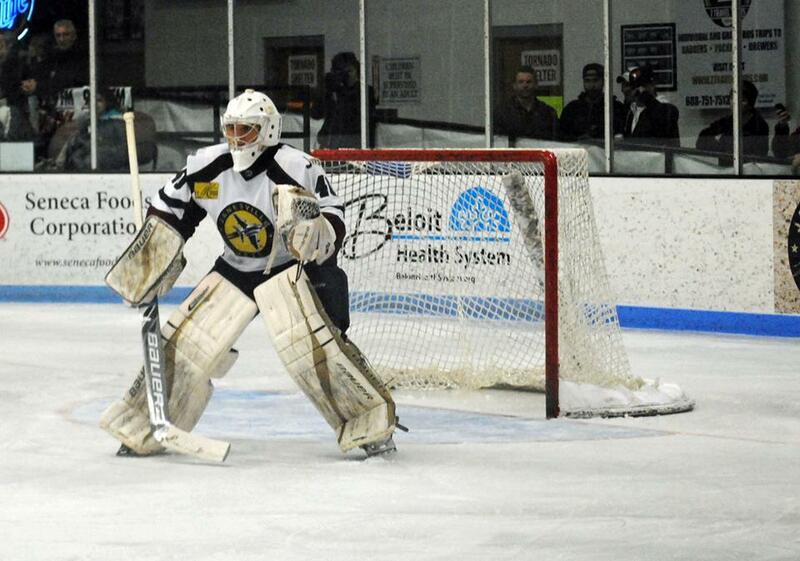 Logan Halladay had a spectacular season with the Janesville Jets and found himself with the no. 16 overall CSS ranking out of all ranked North American goalies (Janesville Jets/NAHL). For an individual that is only 17 years of age, Logan Halladay certainly doesn’t carry himself like a teenager. Not only has Halladay gone through a plethora of experiences that have shaped his character and mental fortitude, the netminder has shown that his work ethic and determination is on par with that of his fellow draft class. Regardless of when/where he is taken at this year’s draft proceedings, there is no doubting the fact that Halladay is a special talent – one that not only has the skills to be competitive on the ice, but one that has the mental makeup to be a strong character individual in any NHL locker-room.